The overall health of Chesapeake Bay improved in 2016, a positive sign that recovery efforts are working. The largest estuary in the nation scored a C grade (54%) in the 2016 report card, one of the highest scores calculated by scientists at the University of Maryland Center for Environmental Science (UMCES). 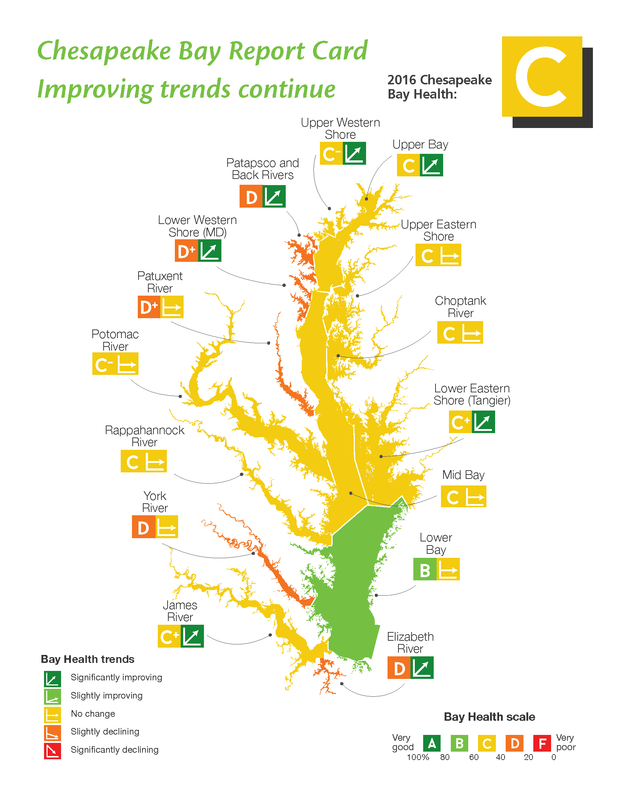 While only a slight improvement, it’s encouraging that the overall health remained steady despite many pressures on the Chesapeake Bay and across its watershed. In addition, fish populations greatly improved to an A (90%). The Fisheries Index is now an A grade at 90% Photo courtesy the Chesapeake Bay Program. The University of Maryland Center for Environmental Science’s Integration and Application Network produces this report card annually to assess the health of Chesapeake Bay waterways, to enhance and support the science, management and restoration of the Chesapeake Bay. For more information about the 2016 Chesapeake Bay Report Card including region-specific data, visit https://chesapeakebay.ecoreportcard.org.